Indian Railways continues to take steps for increased use of environment friendly solar energy to supplement its energy needs. Under this programme, an important initiative has been taken on Tuesday by Ajmer Division of North Western Railway to illuminate its two Railway Stations namely Aburoad and Bhilwara stations in Rajasthan with solar energy. In this connection , Ajmer Division Railway office has signed an MOU with a Railway PSU namely Concor to set up the solar plant at Aburoad and Bhilwara station under CSR (corporate social responsibility). The MOU has been signed between the two organizations at Delhi in the presence of Naresh Salecha, DRM Ajmer Division and Board of Directors CONCOR. Officers of Railways CONCOR were present on the occasion. The Container Corporation of India (CONCOR) has adopted New Delhi railway station to upgrade passenger amenities at the city’s busiest station. A Memorandum of Understanding was signed between Northern Railway and CONCOR. The Public Sector Unit, officials said, will provide passenger amenities as part of its corporate social responsibility. The tentative list of activities proposed include provision of a new green waiting room and other facilities on platform No. 16, operation and maintenance of track cleaning machine, a new toilet block on Ajmeri Gate side circulating area, signages for the differently-abled, development of five water booths with RO and chilling plant, solar-panelled roofing on platforms, complete renovation of all retiring rooms to make them energy efficient, improved furniture in all retiring rooms and dormitory; and energy efficient LCDs in retiring rooms. Transport of goods by rail containers got costlier from April 1. The result could be a shift by big businesses to transportation via road, putting huge pressure on road infrastructure. S P Shastri, Chief Manager of Inland Container Depot, Whitefield, of the Bengaluru branch of Container Corporation of India (CONCOR), a public sector undertaking under the Ministry of Railways, said the hike would affect non-agricultural products like granite, wooden boards and scrap which are being transported over long distances from Bengaluru by container rail regularly. Every month, 1,000 containers go through trains. One train can accommodate 70 containers. “As per the earlier taxation system (in effect till March 31, 2015), a service tax of 12.36 per cent was charged on 30 per cent of the total freight cost. Under the new scheme from April 1, 2015, the same service tax is charged on 100 per cent of the freight cost or the total freight cost,” he said. This would lead to an increase in transportation costs by train, an overall increase of 8 per cent for any goods transporter. Shastri explained, “If the cost of shipping a container with any product is Rs 30,000, the service tax of 12.36% was imposed on only Rs 9,000 (30% of cost) of it, which came to roughly Rs 1,000. However, now the tax would be imposed on the entire Rs 30,000, which would work out to Rs 3,700 per container. A few customers have started objecting to the hike already, the chief manager said. “This step by tax authorities is highly counter-productive. The whole objective behind creating a Container Corporation was to reduce the road traffic but this move will send consignments back on to the roads.” CONCOR is involved only in long-distance operations presently and even that segment will be lost due to this aspect, he added. Presently, roads charge only 30% of the freight cost as was done by CONCOR until the previous financial year. There are 14 main players in the container business in the country and this will impact all of them. “Our Delhi office is now holding talks with service tax authorities to try and bring the tax structure down,” he said. The Railway Ministry and Finance Ministry need to sort out the issue urgently in the interest of exporters and importers, he added. How to re-energise the Railways, and get it back up to double-digit freight growth? One could take pride in Indian Railways’ being one of the largest commercial organisations under governmental control anywhere in the world, with its 1.3 million strong work-force carrying nearly 23 million passengers daily and lifting more than one billion tonnes of originating freight traffic in a year. Yet the standards of cleanliness on its passenger-carrying trains and stations are appalling, to say the least; the availability of berths for travel at short notice is a rarity; and its freight business is fast losing clientele. The fact is that, despite its wide reach and strong presence in the national psyche, there is an all-pervading feeling of resignation and despondency about its quality of service. The complexities of managing this humongous department can be easily visualised from the fact that in the last three years it has accounted for the scalps of three Union ministers for one reason or the other! Tight control over the working of the railways has never been easy. The catharsis experienced by the country in the railway strike of 1974 besmirched the administration as well as the unions. Not for nothing, both have skilfully avoided a repeat of a similar direct confrontation for the last 40 years. But the experience has also made the organisation very conservative, side-stepping issues and detesting strong stands. This has all coalesced into a fierce fondness for the status quo. The last 25 years of coalition politics have contributed handsomely to this state. It is time to take stock of the four issues that should receive the railway minister’s immediate attention. The freight business is the bread and butter of the railway’s finances. The surplus from the freight business is unflinchingly utilised to subsidise the passenger business. In UPA-I, railway finances rode upon a healthy growth in freight tonnage of 8-10 per cent year after year, as can be seen from the Table. The trend for the last three years, however, is 50 per cent below this. Unless IR goes back to its earlier robust growth in originating freight, railway finances are going to remain under tremendous pressure. Two factors have been precluding a higher rate of growth: firstly, the Railways have abandoned the less-than-block-rake traffic altogether, and secondly, the world’s steepest freight rates. First things first. While passengers have multiple choices of class and carriage, in freight services customers have to willy-nilly opt for a full rake constituting 3,500 metric tonnes of material. This take-it-or-leave-it situation has made IR suitable only for carrying bulk traffic like coal, ores and minerals, foodgrain and so on. Consequently, IR has been steadily losing its share of freight movement – down to 36 per cent, from 89 per cent in 1951. Per a McKinsey study, the share may decline to 25 per cent in 2020, causing a loss of five per cent of GDP. The Railways must pull back its share of freight traffic to around 50 per cent by 2020 – a gigantic task, as that means annual growth of more than 10 per cent in originating freight traffic till 2020. But the Railways now depend solely on coal and ores and minerals for growth, which themselves are growing at only around four per cent. On the other hand, it is neither operationally feasible nor financially prudent to start running non-block-rake traffic or start conducting shunting at roadside stations. How to attract this traffic to rail? There are three options: Utilise domestic containers to lift this traffic on a hub-and-spoke arrangement; utilise road railers to pick up piecemeal traffic; and use “RO-RO”, or roll-on, roll-off mode, to carry road traffic such as trucks on rail. The first of these options has already been tried on the CONCOR fleet. The induction of private container operators too was expected to aggregate this piecemeal traffic, but the hopes have been belied. The loading/unloading of containers by gantry cranes or mobile cranes has proven to be quite expensive. The second option has been in the air for quite some time, but needs foreign collaboration, the details of which are proving to be intractable. The option of RO-RO has considerable potential if new wagon designs are adopted to load multiple axle trucks on tailor-made wagons capable of running at 100 kmph in loaded condition – the same as the BLC wagons used for carrying containers. This would be an innovative idea of Indian origin designed to solve an Indian problem. Whatever the ultimately accepted method may be, it should be one which can generate at least 100 million tonnes of additional freight traffic for the Railways in the next two years. Secondly, Railways have fallen into a Catch-22 situation where freight rates are increased to compensate for less-than-expected growth in tonnage, which further drives the traffic away to road, as the Railways prices itself out. The only way to extricate the Railways out of this vicious cycle is to impose a moratorium on any increase in freight rates at least for three years. In the interregnum clients should be wooed back to rail by policies of rebates to loyalists, and so on. Activity on accounting reforms was started 15 years ago, yet there is no sign of its culmination. When FDI and private partnership is being talked about, it is all the more imperative for IR to have a clear idea of sector-wise cash inflows and outflows. Lack of accounting reforms turns off investors and errors on revenue-sharing could later become an issue with the CAG. Indian Railways was last restructured in 1951, when all the princely states’ railways and company railways were amalgamated. The administrative set-up has now become quite unwieldy, rigid and self-perpetuating, at the cost of national priorities. The government has rightly formed a high-powered committee to submit its recommendations. It is hoped that the report of this committee will be made public very soon, since its implementation in the field may prove to be an even more onerous job, entailing two to three years to complete. If not implemented during the tenure of this government, the recommendations will surely meet the same fate as that of three earlier committees – the Prakash Tandon Committee (1994), Rakesh Mohan Committee (2001) and Sam Pitroda Committee (2012). Indian Railways has never been on the frontier of developing or innovating railway technology. It has always lagged behind its global peers on the adoption of new technologies. One primary reason is that there are no professional courses on railway engineering, operations or marketing available anywhere in India. On the other hand, the Chinese Academy of Railway Sciences (CARS) can boast of 2,300 scientific research achievements and 825 prizes for such research till 2012. Even a small country like South Korea is well served by the Korea Railroad Research Institute (KRRI). In India, a Railway university could support high-quality research. The country will be looking for a new avatar of the Indian Railways in the coming Budget. The railway minister has an unenviable task on hand. He has to serve “new wine in a new bottle”. Any compromise with any one of these two components would not go down well with the Indian people without a tinge of rancour. The Indian Railways has generated Rs 860.09 billion of revenue earnings from commodity-wise freight traffic during April 2014-January 2015 as compared to Rs 765.01 billion during the corresponding period last year, registering an increase of 12.43%. Railways carried 906.36 million tons of commodity-wise freight traffic during April 2014-January 2015 as compared to 866.14 million tons carried during the corresponding period last year, registering an increase of 4.64%. During the month of January 2015, Railways generated Rs 100.23 billion as compared to Rs 87.95 billion during the same period last year, registering an increase of 13.96%. Out of which, Rs 47.28 billion came from transportation of 48.93 million tons of coal, followed by Rs 8.77 billion from 9.95 million tons of cement, Rs 7.39 billion from 10.10 million tons of iron ore for exports, steel plants and for other domestic user, Rs 7.68 billion from 4.82 million tons of food grains, Rs 4.95 billion from 3.55 million tons of petroleum oil and lubricant (POL), Rs 5.82 billion from 3.46 million tons of Pig iron and finished steel from steel plants and other points, Rs 5.40 billion from 4.41 million tons of fertilizers, Rs 1.90 billion from 1.75 million tons of raw material for steel plants except iron ore, Rs 4.46 billion from 4.07 million tons by container service and Rs 6.55 billion from 6.75 million tons of other goods. To improve the financial condition of the ailing railways, a committee was set up on Wednesday to examine the existing revenue structure and suggest ways and means for raising earnings of the national transporter. The nine-member panel constituted by Railway Minister Suresh Prabhu has been given a timeline of 18 days for submitting its recommendations. The committee, headed by DK Mittal, a retired IAS officer, has been asked to submit the report by December 21, this year, said a senior ministry official. First the Debroy Committee was announced to suggest restructuring in the Railway Board followed by the Sreedharan Committee to recommend changes in tendering process. The Sreedharan Committee has also been asked to look into the alignment issue of the Katra-Banihal section in the Kashmir rail link project. The latest committee will have Financial Commissioner of Railways as Member Secretary while heads of railway PSUs – RITES, IRCON, RLDA and CONCOR – will be among other members. Since the committee will also explore other sources of funding for the modernisation and expansion of the national transporter, representatives from Boston Consultancy Group and McKinsey India will also be part of the panel. Besides, the committee has been given the power to co-opt any expert if required. It’s common knowledge that the finances of Indian Railways have been severely stressed for several years. Its internal generation of revenues has been inadequate and profits abysmally low. The government, too, is unable to provide the required budgetary support through its Plan fund allocations. In order, therefore, to revive the fortunes of railways in India, the present government has laid great emphasis on encouraging private sector participation, especially in capital-intensive projects, through the PPP (public-private partnership) route, so that infrastructure expansion can take place and the rapidly growing demands of the economy can be met soon. Unfortunately, PPP’s track record with Indian Railways has so far been dismal, though the ever-optimistic Planning Commission continues to provide for substantial outlays under this head in the railway’s Five-Year Plans. A principal cause of failure of the PPP model in the railways has been its failure to nurture the joint partnership the way it should have. Primarily, it is the complex regulatory framework that has deterred private players from joining hands with the railways. Borne out of past experience they also fear they will not be allowed a level playing field, and the conditions governing the partnership shall remain heavily biased in favour of the railways. With a view to setting things right, the railway minister had recently announced that new policies are being devised, procedures being simplified and greater decentralisation of decision-making being introduced to remove hurdles in doing business with private investors. He also said that five different PPP models have been prepared that are open for investment for station development, construction of freight terminals, and new lines to provide for port connectivity. One hopes the minister’s assurances get translated into practice, and pave way for breathing new life into projects that have been languishing for want of funds. Railways should also explore the possibility of opening up train operations—both passenger and freight—to the private sector. Introduction of market competition is seen as a good way for achieving higher efficiency in rail transport and several systems have opted for it. Two good examples are Japan and Britain, both of which have experimented with privatisation of train services, and despite mixed outcomes, have retained much the same structure created at the time of privatisation some decades ago. The state-owned Japanese National Railways was functioning as a monopoly for years, which is why perhaps it was plagued with low productivity, high labour costs, loss of share of transport markets and accumulation of massive long-term debts. In 1987, the government decided to privatise rail operations by splitting passenger services into six vertically integrated networks and creating a single national freight operator that pays access charges to the passenger companies. The government views the outcome of privatisation as a success. Traffic has grown, especially on the three larger passenger rail systems; there has been no significant tariff increase ever since; staff strength has reduced and productivity has more than doubled. A major factor that has contributed to reducing the costs of operation is the replacement of a vertically integrated monopolistic structure with competition among vertically integrated privately-owned train firms. In contrast, the privatisation of rail operations in the UK did not come up to expectations. The main principle driving the British rail policy of the 1990s was not change of ownership, from public to private, but the establishment of competition. It aimed at achieving cost efficiency through maximisation of opportunities for effective competition while retaining its natural monopoly in infrastructure. The new policy was successfully implemented and started to produce some remarkably good results. But, shortly thereafter, there was a change in policy (mainly because of a change in government) under which competition in passenger train services was moderated for the reason that the monopoly profits that the railways were earning on certain routes and using them to subsidise losses on others had come down. Hence, after initial improvements, the service quality deteriorated considerably. Congestion began to interfere with train reliability, and punctuality suffered. It was commented that the failure of railway privatisation in the UK was because of the government’s attempt to create a legal fiction that something was competitive when it was really a monopoly. Competition for British Rail’s freight services has, however, worked reasonably well. There has been significant innovation in both the nature of services offered and methods used, resulting in a marked improvement in performance, productivity, efficiency and customer service. 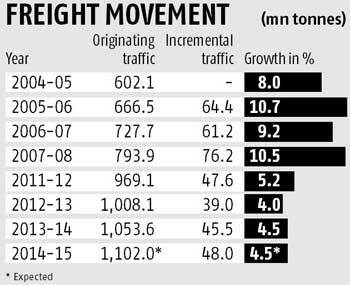 Freight volumes have grown by 50% in the past 10 years, reversing four decades of decline. It was said “the success of Rail Freight points to harnessing market forces and creating appropriate incentives rather than regulatory or structural change as the way to improve performance”. Indian Railways has already taken some steps in this direction by granting licences to private operators to run container train services, and permitting them to compete with the Container Corporation of India (CONCOR), which was the monopoly operator of these trains. The share of rail increased even on routes where CONCOR services existed. Faced with competition, CONCOR was forced to improve its services and reduce its tariffs to remain competitive. With the Dedicated Freight Corridors coming up, the trains that will be running on the new routes can also be offered to private players similarly. Short distance inter-city passenger services, wherever considered feasible, could also be handed over to private operators, following the British model where infrastructure is owned by the railways, but trains are operated by private companies. Since there are large sunk costs in railway infrastructure, these companies may be asked to pay access charges for track usage. Experience of rail privatisation in Britain can be helpful in steering clear of the problems faced by the British Rail. The privately-owned trains could either be given exclusive rights for the selected routes or be permitted to compete with Indian Railways. Times are changing, and the monopolies in public services have become anachronistic. By switching over to a system where private players are allowed to compete for market share, Indian Railways can look forward to evolving itself into a more efficient and commercially viable organisation. There should be better days ahead. By S N Mathur. The author is a former MD of Railway Finance Corporation.